Worthy Christian Chat - Page 5 of 7 - Join thousands of Christians in our free Christian Chat Rooms! I thought I would do a series of teachings on the parallels on one of the most “prophesied” event in the Old Testament — and the focus of the New Testament authors — the Resurrection. Most people have never examined how many stories are directly connected to the most historic and earth changing event in the history of the world — the resurrection. I will begin with the sign of Jonah and continue this series showing how many “pictures” of the resurrection are throughout the Scriptures. Jonah is laid out in a chiastic structure, which means that it a story that is laid out in a fashion where the story is unveiled — then its central theme is identified — then re-wrapped the same way it was originally wrapped. So it’s a story wrapped up with Jonah being cast into the sea and concludes with the sea casting Jonah to the land. Each point A coincides with A, and B with B, so this story unveils itself in a unique way so we can examine the main point. The main point of Jonah — that he was driven out of the sight of the Lord — yet will once again look to the Temple! He’s referring to Jonah’s sign — of three days and three nights — the number 3 will be used by the LORD over and over again as a sign of the resurrection. Just as Jonah “died” and was “resurrected” so this was a sign of the resurrection. Jonah should have died — yet he didn’t! Jonah swallowed by a great fish — a picture of death. Was in the belly of the fish, three days and three nights — a sign of the burial of Yeshua. Jonah being spew up out of the belly of the great fish — the resurrection. Notice that Jonah’s head was wrapped — Jonah 2:5 weeds were wrapped about my head as a picture of the crown of thorns! Just as Yeshua left His glory when he came to earth — driven out of the sight of the Lord at his death — YET He was restored to His glory in the Holy Temple. As you can see the picture of Jonah is much deeper, and I’ll do a series of teachings dealing with one of the most prophesied events in the Bible — the resurrection! The Prophetic Opportunity You Have Before You! As I speak around the world, I’m often talking about the “greatest” opportunity that we’re a living part of! So often in the discussion of the “end of the world” a bunker mentality — or a “escapism” mentality develops instead of “seizing” the day! Act 15:13 After they finished speaking, James replied, “Brothers, listen to me. But James stops in the passage, and the reality is that this passage is being fulfilled in our day! How can they build waste cities — or return back to their land — unless they were first expelled from the land — and RETURNED to the land! This is happening in our day! This is the Keil – Delitzsch commentary of this particular verse so we can better understand its meaning. The harvest is SO ABUNDANT, that there’s reaping and sowing happening at the same time! Mat 13:29 But he said, ‘No, lest in gathering the weeds you root up the wheat along with them. The harvest of the world is upon us. What most people don’t understand is what is happening on a global scale, and what generation we’re a part of! 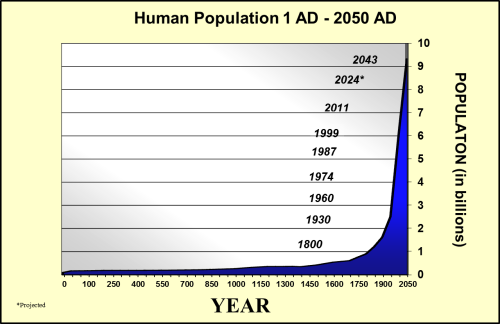 As you can see the population of the world was ESSENTIALLY FLAT for 1900 years after the birth of Christ. But now it’s shooting STRAIGHT UP! It’s the HARVEST coming to pass! If you can imagine this — let’s suppose for hypothetical sake that 10% of the world comes to a saving knowledge of the Lord. The population’s of the world combined for the first 1900 years let suppose is about 4-5 billion people. So hypothetically for the first 1900 years roughly 400,000,000 to 500,000,000 people came to faith. We’re alive and the population of the world is over 7 billion people! So if we continue with our same “hypothetical” understanding then we will see 700,000,000 people come to faith. But if you were seeing all the signs of the truth — and prophecy being fulfilled — my thoughts are it could MUCH HIGHER than these “hypothetical” estimates! We’re will see MORE PEOPLE come to faith in our LIFETIME than the ENTIRE HARVEST of the WORLD for the previous 1900 years COMBINED! And we’re alive for this! We’re alive to see the fulfillment of the entirety of Amos’ prophecy! So often, I’m confronted with challenges in the chat rooms with simply the fact we get so many people that come that do not know the Lord and when to say “enough is enough” when they are clearly simply a “weed” that the enemy is sowing in the field of wheat! But the Lord says to allow them to “grow together”, however at some point, you realize that you’re simply “casting pearls before the swine” and it’s time to cut the rope and let them be on their way. This is a tough balance that is always weighing on the hearts of the moderators. We are a ministry of outreach — FIRST and FOREMOST — why? Because that is our commission by the Lord! If we neglect this commandment — we’ve forgotten our whole purpose for being here! We’re called to be “fishers” of men. If you can imagine someone fishing — they don’t pull in fish perfectly cleaned, fileted, and ready to eat! The first thing fishermen do is you need to go to the lake, river, or ocean where “fish” gather. Can you imagine trying to fish on your front yard? You wouldn’t catch any fish! You can’t catch fish — unless you’re in the water! Secondly, when you cast a net to draw in a school of fish, you have to understand that you often draw in all kinds of “unwanted objects”. The old tire, the old shoe, the stick! Jewish fisherman often had to separate the “clean and the unclean” fish! Catfish was considered unclean, while Tilapia (St. Peters fish) was clean. But you can’t separate the fish — until you draw the net in! Thirdly, even after the catch — the fish need to be scaled, gutted, and deveined! It’s a MESSY process! If it were easy, we wouldn’t be called fishers of men! So people don’t like the “messiness” of fishing for men, whereas I see the schools of fish just waiting for us to cast the net! I see prophetically the millions coming to faith in our generation — and we’re part of it! If you didn’t get a chance to listen to my message — It’s not the end of the world — I suggest listening to it to get an understanding of where we are prophetically. Are you prepared spiritually for the greatest opportunity the Lord has provided us? So the next time you post — perhaps you should remember that every word — is being judged by the King of Kings — and before you post — ask yourself — is this “worthy” of being recorded in the books? I believe people don’t realize that their posts are being read by thousands of guests on a daily basis — is your post drawing in the fish? Or is it creating a whole in the net? I pray that this message is taken to heart — for we’re part of the prophetic history! Just some thoughts, mostly scripture: How will you know them? Just some thoughts, mostly scripture:How will you know them? 1Jo 4:20 If someone says, “I love God,” and hates his brother, he is a liar; for the one who does not love his brother whom he has seen, cannot love God whom he has not seen. 21 And this commandment we have from Him, that the one who loves God should love his brother also. Matt 7:16“You will know them by their fruits. Grapes are not gathered from thorn bushes nor figs from thistles, are they? 17 “So every good tree bears good fruit, but the bad tree bears bad fruit. 18 “A good tree cannot produce bad fruit, nor can a bad tree produce good fruit. 19 “Every tree that does not bear good fruit is cut down and thrown into the fire. 20 “So then, you will know them by their fruits. What is this “bad fruit”? Gal 5:19 Now the deeds of the flesh are evident, which are: immorality, impurity, sensuality, 20 idolatry, sorcery, enmities, strife, jealousy, outbursts of anger, disputes, dissensions, factions, 21 envying, drunkenness, carousing, and things like these, of which I forewarn you, just as I have forewarned you, that those who practice such things will not inherit the kingdom of God. So What Sort of Fruit Do I Produce if I am a believer? Gal 5:19 But the fruit of the Spirit is love, joy, peace, patience, kindness, goodness, faithfulness, 23 gentleness, self-control; against such things there is no law. 24 Now those who belong to Christ Jesus have crucified the flesh with its passions and desires. Matt7:21“Not everyone who says to Me, ‘Lord, Lord,’ will enter the kingdom of heaven, but he who does the will of My Father who is in heaven will enter.22“Many will say to Me on that day, ‘Lord, Lord, did we not prophesy in Your name, and in Your name cast out demons, and in Your name perform many miracles?’ 23“And then I will declare to them, ‘I never knew you; DEPART FROM ME, YOU WHO PRACTICE LAWLESSNESS.’24“Therefore everyone who hears these words of Mine and acts on them, may be compared to a wise man who built his house on the rock. 25“And the rain fell, and the floods came, and the winds blew and slammed against that house; and yet it did not fall, for it had been founded on the rock. 26“Everyone who hears these words of Mine and does not act on them, will be like a foolish man who built his house on the sand. 27“The rain fell, and the floods came, and the winds blew and slammed against that house; and it fell—and great was its fall. ”But How Can I Know What the Will of God Is”? Rom 12:1 Therefore I urge you, brethren, by the mercies of God, to present your bodies a living and holy sacrifice, acceptable to God, which is your spiritual service of worship. 2 And do not be conformed to this world, but be transformed by the renewing of your mind, so that you may prove what the will of God is, that which is good and acceptable and perfect. Well, I am a believer, I love Jesus, that is enough, right? I mean not all believers do good works. John 14:12 “Truly, truly, I say to you, he who believes in Me, the works that I do, he will do also; and greater works than these he will do; because I go to the Father. 13 “Whatever you ask in My name, that will I do, so that the Father may be glorified in the Son. 14 “If you ask Me anything in My name, I will do it. 15 “If you love Me, you will keep My commandments. I am not perfect, but I do have some of these characteristics of Love, Fruit Works and Obedience. 2 Pe 1:1 To those who have received a faith of the same kind as ours, by the righteousness of our God and Savior, Jesus Christ: 2 Grace and peace be multiplied to you in the knowledge of God and of Jesus our Lord; 3 seeing that His divine power has granted to us everything pertaining to life and Godliness, through the true knowledge of Him who called us by His own glory and excellence. 4 For by these He has granted to us His precious and magnificent promises, so that by them you may become partakers of the divine nature, having escaped the corruption that is in the world by lust. 5 Now for this very reason also, applying all diligence, in your faith supply moral excellence, and in your moral excellence, knowledge, 6 and in your knowledge, self-control, and in your self-control, perseverance, and in your perseverance, godliness, 7 and in your godliness, brotherly kindness, and in your brotherly kindness, love. 8 For if these qualities are yours and are increasing, they render you neither useless nor unfruitful in the true knowledge of our Lord Jesus Christ. 9 For he who lacks these qualities is blind or short-sighted, having forgotten his purification from his former sins. 10 Therefore, brethren, be all the more diligent to make certain about His calling and choosing you; for as long as you practice these things, you will never stumble; 11 for in this way the entrance into the eternal kingdom of our Lord and Savior Jesus Christ will be abundantly supplied to you. That Sounds like works righteousness, I thought we are saved by grace alone, through faith, and I do believe after all! Ja 2:14 What use is it, my brethren, if someone says he has faith but he has no works? Can that faith save him? 15 If a brother or sister is without clothing and in need of daily food, 16 and one of you says to them, “Go in peace, be warmed and be filled,” and yet you do not give them what is necessary for their body, what use is that? 17 Even so faith, if it has no works, is dead, being by itself.19You believe that God is one. You do well; the demons also believe, and shudder. Oh, so we are not saved by works, we are saved for works maybe? Eph 2:8 For by grace you have been saved through faith; and that not of yourselves, it is the gift of God; 9 not as a result of works, so that no one may boast. 10 For we are His workmanship, created in Christ Jesus for good works, which God prepared beforehand so that we would walk in them. I am generous, I give of my time and my money, what else should I be doing? Matt 28:19 “Go therefore and make disciples of all the nations, baptizing them in the name of the Father and the Son and the Holy Spirit, 20teaching them to observe all that I commanded you; and lo, I am with you always, even to the end of the age. ”Notice that Jesus told the apostles to make disciples, and to teach us to obey everything that he commanded them. The thing He just commanded them to do was to go preach and make disciples, therefore, that is our job also. Obedience is not an option.We have three choices: Service, lip service, or rebellion. Service is God’s will. lip service, is hypocrisy. Even a casual reading of the Bible reveals that God hates hypocrisy. Do we even need to think about rebellion? He gets it, do we?